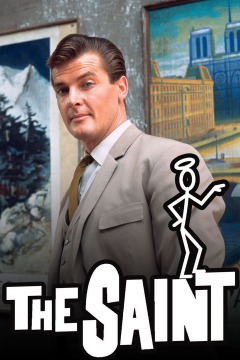 Simon Templar, a wealthy adventurer known as The Saint, travels around the world in his white Volvo P1800S. The Rhine Maiden: Templar finds himself on a train speeding through Germany as he trails the culprit responsible for threatening a pretty girl's life. The Inescapable Word: Templar forgoes his grouse-hunting and investigates strange beams of light that accompany mysterious deaths on the moors of Scotland. The Desperate Diplomat: Templar teams with a diplomat's daughter (Suzan Farmer) to discover why her father, Simon's old friend, stole from his beloved country. The Organization Man: Templar infiltrates a secret mercenary force working under cover at an exclusive health farm; guests Tony Britton, Caroline Mortimer. The Double Take: Two men separately employ Templar, each claiming to be a tycoon threatened with ruin by an exact double of himself; guest Kate O'Mara. A Time to Die: Templar stalks an avenging killer bent on playing a clever game of cat-and-mouse with his pursuer; guests Suzanne Lloyd, Maurice Good. The Sign of the Claw: Templar comes to the aid of a woman (Suzan Farmer) while looking for the source of terrorist attacks in the jungles of Southeast Asia. The Golden Frog: A quest for gold puts Templar, a seductive girl and her swindler father in the middle of an escalating revolution in Latin America. The Saint Plays With Fire: Templar's life is in danger when he is convinced that arson killed a newspaperman investigating a neo-Nazi party operating in England. The Frightened Inn-keeper: The lives of an innkeeper's daughter and Templar are in peril when a tunnel dug beneath an inn causes more trouble than anticipated. The Crime of the Century: At Chief Inspector Teal's request, Templar takes advantage of his resemblance to a safecracker to infiltrate a ruthless criminal gang. The Happy Suicide: Murder halts the plans of an entertainer's brother to write an expose on the performer's true personality; guest Donald Sutherland. The Checkered Flag: When a girl accuses a racing driver of stealing her father's invention, Templar calls upon his driving skills to uncover the truth. The Abductors: A plot to give an unwilling scientist to a foreign power turns dangerous, forcing Templar to seek refuge in a tourist's hotel room. The Crooked Ring: Templar steps into the boxing ring and squares off with the Masked Angel to discover why so many recent bouts have resulted in death. The Smart Detective: A detective boasts the security system he developed to protect a cache of emeralds is foolproof, a claim that leaves Templar skeptical. The Persistent Parasites: The gathering of a man's (Cec Linder) three ex-wives at his villa in southern France brings surprises and murder; guest Jan Holden. The Well-Meaning Mayor: The death of one of two political rivals in a town leads Templar to believe someone in the municipal government is heading a racket. The Master Plan: Templar and a woman (Lyn Ashley) fall into the clutches of a narcotics-smuggling organization while trying to locate a missing man. The House on Dragon’s Rock: Templar and the niece (Annette Andre) of a research scientist search through a labyrinth of tunnels underneath a mountain in Wales. The Scales of Justice: Templar's suspicions are aroused when four directors of one corporation die suddenly, apparently of heart attacks; guest Jean Marsh. The People Importers: On a quiet fishing expedition, Templar unwittingly sails into the middle of a deadly smuggling ring. The Man Who Could Not Die: Templar cautions a man not to embark on a hunting expedition with a friend, a blackmail victim whose tormentor has just been murdered. The Saint Bids Diamonds: An astrologer's prediction of danger for Templar comes true while Simon is impersonating a diamond-cutter to retrieve a stolen jewel. The Spanish Cow: Police suspect Templar of plotting to steal jewels belonging to the recently escaped widow of an assassinated South American president. The Old Treasure Story: Templar seeks treasure located on a map divided into three sections held by three different people; guests Jack Hedley, Robert Hutton. The Queen’s Ransom: Danger and a royal lesson in humility accompany Templar's mission to transport a queen (Dawn Addams) to Switzerland to obtain jewels. Interlude in Venice: Templar rescues an attorney's daughter (Quinn O'Hara) from a vengeful gangster, only to have her lured back to the mob figure's villa. The Russian Prisoner: A Soviet physics professor defects while attending a convention in Geneva, leading Templar to attempt to reunite him with his daughter. The Reluctant Revolution: A beautiful assassin gets Templar involved in a plot to overthrow a South American dictator, a scheme that could cost Simon his life. The Helpful Pirate: A famous scientist vanishes after falling into a trap set by swindlers using treasure as a lure. The Wonderful War: Templar uses loudspeakers, tape-recorders, fireworks, friends and a pretty girl to wage war against a Middle East oil-producing state. The Convenient Monster: Templar attempts to determine whether the legendary Loch Ness monster is responsible for deaths and destruction on the Scottish moors. The Angel’s Eye: Templar becomes suspicious when a noted Dutch diamond cutter denies seeing a gem Simon knows was brought to him; guest Jane Merrow. The Sporting Chance: While fishing in Canada, Templar meets a German scientist (Gerard Heinz) who wants to return to his communist nation to see his family. The Man Who Liked Lions: Elements of ancient and modern Rome overlap when Templar investigates the stabbing death of a reporter who was tracking a major story. The Better Mousetrap: Templar cannot even trust his girlfriend (Alexandra Stewart) when he is under suspicion after stolen jewels are put in his hotel room. Little Girl Lost: Templar receives a request for protection from a beautiful girl (June Ritchie) claiming to be Hitler's daughter; guest Noel Purcell. The Paper Chase: Templar becomes involved in international espionage when a government employee is duped into smuggling secret papers into East Germany. Locate and Destroy: Templar joins forces with Israeli agents to catch a Nazi operating a gold mine in South America; guests John Barrie, Francesca Annis. Flight Plan: After saving a girl (Fiona Lewis) from a high-heeled nun's kidnap attempt, Templar must depend on a dying man to help him fly a plane. Escape Route: Templar fights for his life when he goes to jail as part of a plan to bust a prison-escape ring; guests Donald Sutherland, Jean Marsh. The Persistent Patriots: Templar is caught in blackmail, jealousy and murder after saving the life of a British colony's prime minister; guest Edward Woodward. The Fast Women: Templar is literally caught in a crossfire when he gets between two women competing on the racetrack and for the attentions of a man. The Death Game: A murder game gaining popularity on college campuses turns out to have more sinister implications than the student enthusiasts realize. The Art Collectors: Templar saves a woman from thieves in Paris, then must bargain among several parties claiming ownership of paintings in her possession. To Kill a Saint: Templar finds himself hired to be his own assassin after he is fired upon and his card is found at the scene of an attempted murder. The Counterfeit Countess: Templar is nearly killed when he accidentally runs afoul of counterfeiters, then is marked for death by the ringleader (Kate O'Mara). Simon and Delilah: Templar negotiates with the kidnappers of an actress despite believing that the abduction was a publicity stunt; guest Ronald Radd. The Island of Chance: A poison dart cuts short Templar's West Indies meeting with an old friend, but not before the man tells Simon about a vast gold hoard.